A quote from my brilliant son. It is so true! Tonight the bf is sick so I made a delicious dinner and finished it up with these bad boys here shown in the picture. Chocolate makes everything better in my world plus it’s national chocolate day so I figured, sure why not? Plus I still had a bag of chocolate chips in the cabinet. I had just creamed the butter and sugars to perfection in the stand mixture when it occurred to me… I have no eggs! The recipe called for 2 eggs! What’s a girl to do? So, being the skilled problem solver that I am, I took from my experience with vegan baking and poured some apple cider vinegar into about a half a cup of milk. I let it sit for about 5 minutes and then beat it into the butter and cream mixture. I followed the recipe as usual after that. To my relief the cookies came out amazing! I much prefer them without the eggs now.They are not as cakey and still slightly chewy in the middle. They also are a little thinner and I like them like that. This recipe could have easily been made vegan if I had Earth Balance available instead of regular butter. So there you have it. Don’t be afraid to be daring and take risks in the kitchen. You might discover a new trick or shortcut for something you have made million times before. 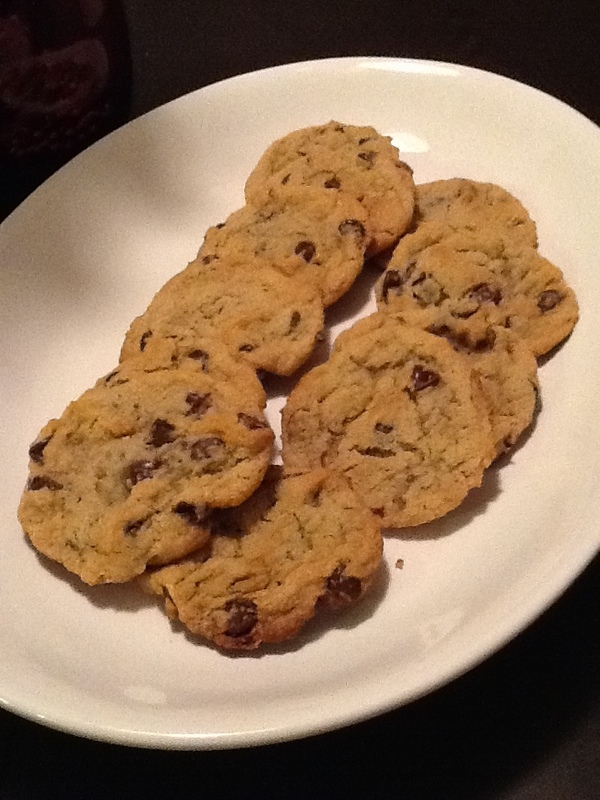 If you want the exact recipe for these chocolate chip cookies, just let me know! I posted a vegan cookie recipe this evening! I used coconut oil in place of butter/milk/eggs and it worked like magic! That’s brilliant! I had coconut oil in the cupboard, too. Next time I will use that. I don’t know about you, but I love the subtle taste that coconut oil lends to food, too.